Can you afford Google Adwords? Measuring your returns & value. Can you afford Google Adwords? Tracking your Returns with Adwords Tools & Analytics. "You pay £250 and we buy some clicks. Feedback? We tell you when it's spent and we need another £250. "Our results for Leisure Batteries, were excellent; over 10% CTR for 9p/click. The returns were too low so we stopped the campaign." Rob McGonigle. "When your Adwords convert high-margin sales, you should have NO marketing budget cap. " `"With your 50+% quote request rate for this Ad group you 're murdering your competitors converting 5% at best. Keep those Ads showing in the conversions sweet spot". is your Return On Investment, ROI. When you pay for a service you expect to see results. If you don't see results you should beware and stop paying. Many pay Google directly. They may learn to optimise their Adwords using Google's reports but without tracking returns they just pay Google more efficiently. Our amber example wasted time & cash but not a lot. Many ideas are worth a try; the trick is to fail the bad ideas fast! Are you already paying Adwords? Get you free Adwords Audit. a sale, contact details. You can assign a value to each conversion type or pass the value of a sale. Using conversion tracking you can start to measure your ROI. If your ROI could be better you need to look at your website. So it is not surprising that Google introduced Analytics to their Adwords clients first. The tracking code gets added to every page so you can track the paths that visitors take. Other web stats solutions existed and for quite a time were a lot better. But Google kept improving without you having to do a thing! and generate executive summary reports and dashboards. Finally Google created code that swaps around your page copy and images just as it swaps and tests your little text ads. Is this all too Complicated? Look at our Why Adwords page to see two other things you can do that are more important. Adwords needs watching, see right, and is very suitable for out-sourcing. Ensure that your Adwords Service provides regular reports. The data contains a lot of market intelligence you can learn from and they should be keen to add Analytics to your site! The Adwords Bidding Bar keeps getting Higher! Back in 2008 the downturn brought more business into the Adwords bidding war increasing competition, bids and Google's profits. In 2011 the biggest change was over on the free Google listings. Last year was the "year of the brand". Google's top results became dominated by the top brands after their latest updates, They had tracked that searchers were more likely to look for Amazon, etc.. Google also were responding to legal challenges in Europe by big brands against competitors bidding their brands on Adwords with more Sitelinks, below. This year has seen the introduction of double-length headlines. These only show for Ads in the top positions, above the free search results. These Longer headlines, with more Keywords in the largest font, generate higher Click-through-Rates. This local example, above also illustrates the use of Adwords Extensions. For local businesses these also work to deliver more clicks by letting the searcher see confirmed Addresses from Google Places. Location Addresses show for Adwords in Top and the Top Side Ad positions. 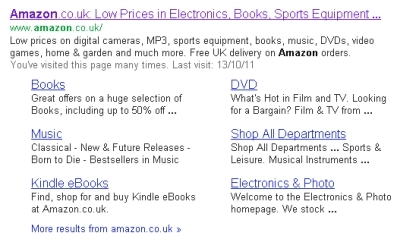 Another improvement to Ads in the top positions only are Ad Sitelinks. These can help to demonstrate the ranges available on ecommerce sites. One-line sitelinks, shown above,. can increase CTRs by 15% and two-line sitelinks can boost CTRs by up to 40%. The Conversion sweet-spot has moved up too. In the past, for many comparison markets, Adwords professionals was the conversion sweet-spot lie between 3 to 4. People do not go back up to take a similar offer unless they have strong loyalty or trust in the top brand. An existing login can save more time than 2 clicks. There are products that convert best at position 1. It has been termed a 'search marketing laziness tax' but whilst Google manages and adjusts their dynamic ad brokerage they also provide tools and alerts for advertisers. At PPC Promotion we track dozens of campaigns from a wide range of markets, using scientific methods to identify the conversions sweet-spot and the impact of the latest changes. Lessons learned on one Campaign are deployed for all relevant clients. Thus PPC Marketing is the most suitable marketing channel to outsource.